Today is my first blogiversary, and there is no better way to celebrate than to have a giveaway! This week, I am giving away eight fat quarters of Art Gallery Fabrics Arizona line by April Rhodes. Also, you will need some pretty navy Aurifil thread! Last week, I introduced my first pattern, Sand Drift. I think I need to giveaway a pattern to the lucky winner as well. Thank you so much for reading my blog over the last year. I am so grateful for all the lovely comments I have received. Thank you! I have been working all summer with the Arizona line. I can't complain too much about that. I love that fabric line, but it nice to see the Sand Drift block in some new colors! For this block, I used AGF Spring Harvest Sweet As Honey by Bonnie Christine in Rooted in Midnight, Free Spirit Aviary 2 by Joel Dewberry in Vintage Yellow Woodgrain, and Michael Miller Waterfront Park by Violet Craft in Flight in White. I also used Kona Cotton solids in berry and curry. To enter the giveaway, please enter a comment below. If you are a new or old follower via Bloglovin', email, or anything else, then leave a second comment for a second entry. The giveaway ends Friday, August 29, at 5pm PDT. I will draw one lucky winner using random.org. Those fabrics are gorgeous! Thanks for the chance! The moment I saw your Sand Drift Quilt I knew I wanted to make one for myself, it is a beautiful pattern! I follow you on Bloglovin' ! Happy anniversary! 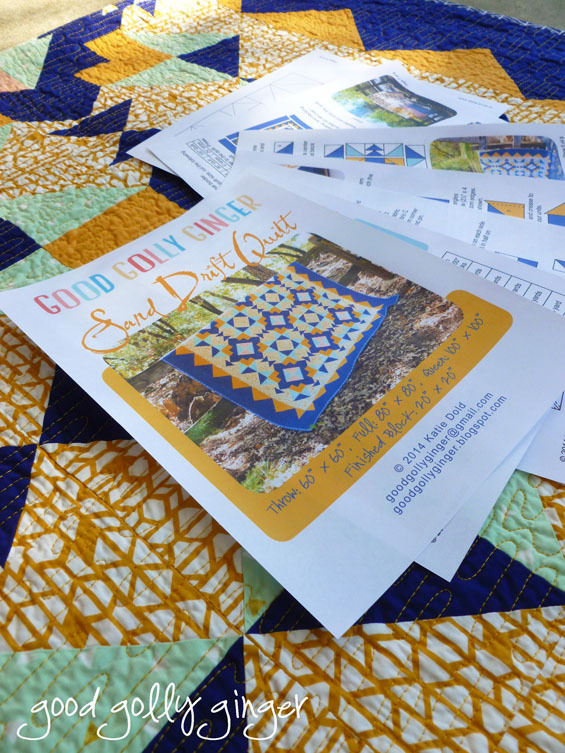 I do adore the blue and yellow tones of your new Sand Drift Quilt and pattern! Wow, one year!!! Big congrats on the milestone. Your pattern is lovely. I love your Sand Drift pattern. Congrats on one year! 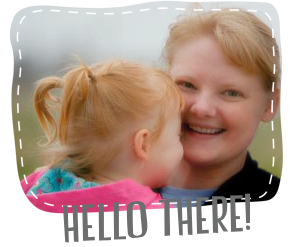 Hi Katie, (my daughter's name) Happy blogiversary! Love the blue and gold. 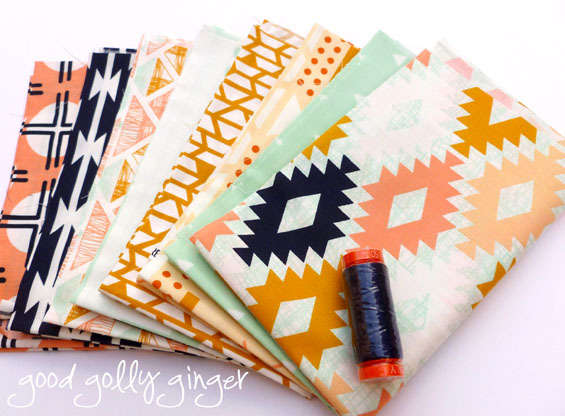 I follow Good Golly Ginger on bloglovin. Happy Anniversary! Love the Sand Drift quilt and the colors you chose are perfect. Here's to the next year! I follow via Bloglovin. I don't comment often but really enjoy your post and look forward to them. I follow on Bloglovin'. Congrats on one year! I follow your blog on feedly. Congrats on the anniversary! I really love the design! thanks! I have to say, I love your blog name! Lovely pattern, thanks for the giveaway! Congratulations. Beautiful quilts you create. Your baby girl is lovely with her red hair. Thanks for the giveaway. Wow, beautiful pattern and fabric!! Love your style! That's a beautiful quilt! I love your fabric. So pretty! Its a great classic feeling pattern. Congratulations on your first pattern and your blogiversary. Love your pattern! Awesome giveaway. Thanks for the chance to win! Happy blogiversary!! Do you get a cake? Beautiful quilt Ms. Ginger! Thanks for the chance. Congratulations one year! And the pattern release too! Love your quilt (& cooool that it's Your own! Sweet! )....Awesome job!! 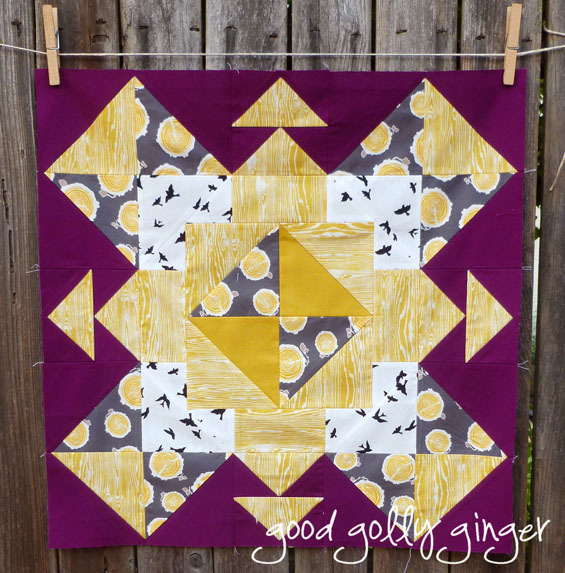 Beautiful pattern and congrats on your one year blogiversary! Happy anniversary and congrats on the awesome pattern! I like the pattern with the Arizona fabric, but you're right now it will be fun to see in other fabrics. Happy first blogiversary! Love your pattern! Follow you on Bloglovin: Nicole Sender! Happy Blogiversary! What a generous way to celebrate. Thanks! I love your block in new colors as well as Arizona! Happy Blogiversary, congrats on your pattern release, and thanks for an awesome giveaway!! I have been following you on bloglovin! Congratulations on your blogiversary and your pattern release! The colours and prints in Arizona are just perfect for the quilt, thanks so much for the chance to win. Love the way the colours go in both versions lf the block. Congratulations on your first Blogaversary and congratulations on your pattern release. I am a new follower on Bloglovin. Thanks! Happy Blogiversary! I'm following on feedly! cute pattern. really love it in the yellow and purple fabric. thanks for a chance to win. Congrats on your first year. Great quilt pattern and thanks for the chance to win some fantastic prizes. I've been crushing on Arizona for a while. I love seeing your block in the other colors! Happy one year anniversary! Quite a milestone! Love this fabric and your pattern. Thanks for celebrating with giving a gift to us :-) . I am a follower of your blog on Bloglovin'. I love how Native American the fabric designs are! Congratulations on your milestone! I would love a quilt using your pattern made with blacks, whites, and vibrant pinks and blues. Sand Drift is a beautiful quilt! Thanks for the giveaway! Happy blogoversary! Love the pattern and your color choice. Love the purple and yellow together! Waterfront Park is my new fabric obsession. Love to see it mixed with other lines. Happy Anniversary! So glad I found your blog. Following you on bloglovin'. Thanks for the chance to win! Love your quilt. The colors are perfect. Beautiful quilts, love the pattern! Congratulations on your quilt pattern. Would love to get some Arizona prints. I saw this line right after I promised not to buy myself anymore fabric until I finish some WIPs....if I won some that would be a totally different story :) Congrats on the pattern release! Congrats on your new pattern! Love the purple one! I love your color palette for that quilt. Happy Blogiversary! I love this fabric, and your pattern. Thanks for the giveaway! Congrats on the pattern release. Thanks for the Giveaway. Happy 1st Blogaversary. Your quilt pattern is beautiful. Congrats on your blogiversary. :) The fabric is beautiful, and your block is amazing! Nice pattern, I really like the fabrics you used. I'm a follower via Bloglovin. Thanks for the giveaway. I'm a follower via email, bloglovin Thanks for the chance. I love this fabric, and your pattern and quilts are gorgeous. Thanks for sharing with us. I love the complementary colors in your latest block. I think I need to do something in purple and yellow soon! Following you on Bloglovin', too! Congratulations on your first Blogiversary, Katie! And thank you so much for the generous giveaway opportunity! Your quilt pattern is fantastic. It's nice to see it in a new colour palette! I'm a happy follower via Bloglovin'. What a fun block! It makes great secondary patterns. Your Sand Drift quilt is absolutely beautiful...congrats on your blogiversary!! Happy Blogiversary, I love your Pattern. I absolutely love your pattern, especially in Arizona, which is one of my favorite fabric lines recently. Congrats on your blogiversary! Just started following you! 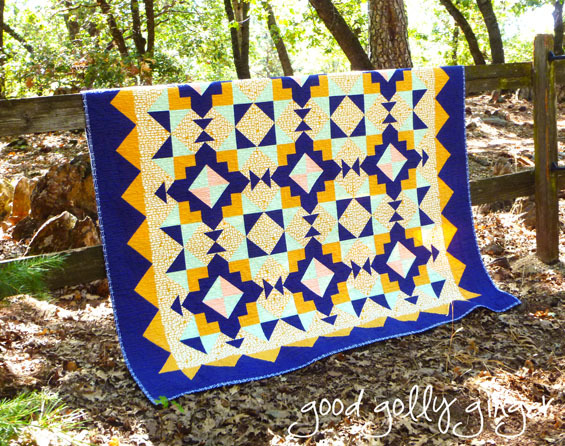 I LOVE the colors you've used in your quilts! Happy to have discovered you! Happy anniversary! Happy blogiversary and thanks for the giveaway! Sand Drift is a unique pattern and I love it. I also love anything Arizona, especially April Rhodes collection. Congrats on your blogiversary and thank you for nice giveaway! Have fun blogging some more! Excellent pattern! I'd love a chance to win. Thanks!! Wonderful pattern. Thanks for the giveaway. Lovely pattern! Thanks for the chance! Happy anniversary! Love your color choices for the Sand Drift quilt. I've also been following you via bloglovin. Love keeping up with you! Happy anniversary! I love your Sand Drift block and the dark cherry version is incredible!